Zombie Gameboy Cries Out For "GAAAAAMMMMEEEESSSS!" A videogame sculptor brings to life the most terrifying handheld experience since Harlem Globetrotters: World Tour. It's the middle of the night when the sound of a slow, creaking door awakens you from restful slumber. You follow the eerie noise down the hallway outside of your bedroom to the closet reserved for all of the old electronics you stopped using ages ago, but just couldn't bring yourself to throw away ... a computer graveyard, if you will. You muster your courage, convinced that your cat has simply gotten tangled in the wiring of your old Commodore 64. That's when you see him, mindlessly munching on the motherboard of an Atari Jaguar. 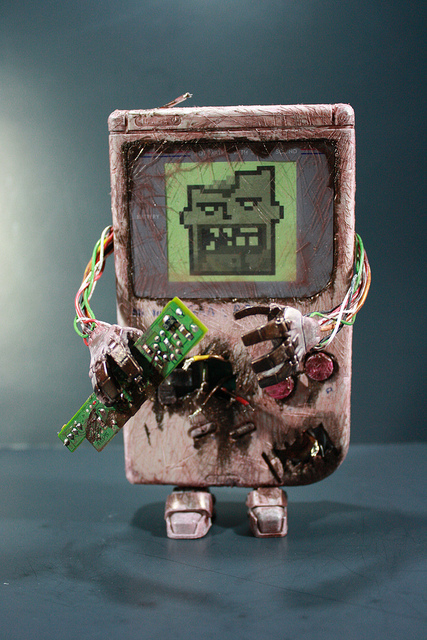 It's ... a ... Zombie Gameboy! Ruuun! Donald Kennedy (or "kodykoala" to his online followers) is a thirty-one year old sculptor living in El Paso, Texas. 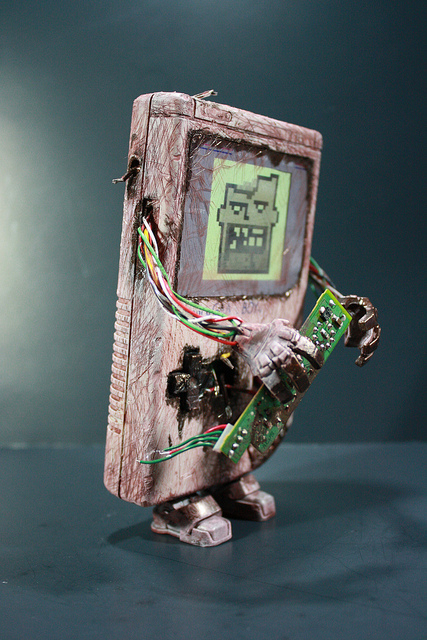 He's been known to create all manner of custom videogame-themed statues, but the Zombie Gameboy may be his best (or at least the most terrifying). According to Kennedy, he first got the idea for his undead handheld after reminiscing about Captain N: The Gamemaster (like ya do), and the human-sized Gameboy character who wore his face on his front screen. 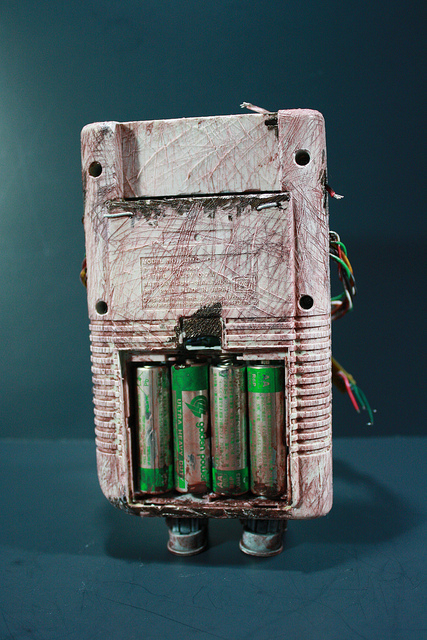 Apparently, the Gameboy he was fiddling with at the time was decently banged up, so he decided a zombie theme would be just the thing to bring it back to life. For the face, Kennedy printed out a weird little undead face from design website SpareType. For the feet and hands, he amputated a couple from an old Iron Man Mark I action figure and an Iron Monger collectable respectively, and repurposed them for his superior Frankensteinian creation. In one of the creature's hands, he holds a circuit board he's undoubtedly eating until he can find some nice, juicy brains. Kennedy hasn't said where he got the board, but I like to imagine it came from a Nintendo 3DS. Sadly, if you were hoping to take the little guy home, he's already been sold for a cool hundred bucks. I guess you'll have to find a different way to clear out that closet after all. 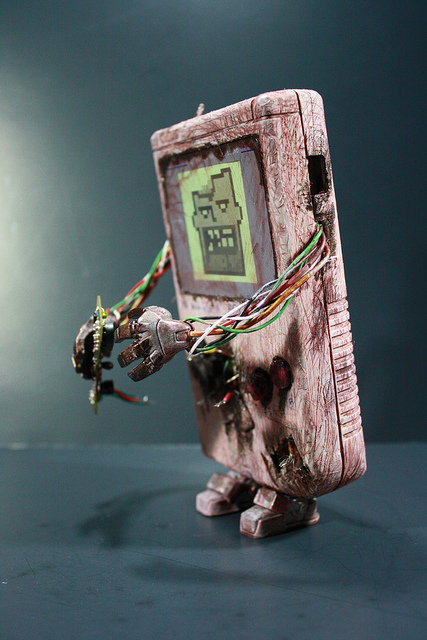 More photos of Zombie Gameboy and the rest of kodykoala's work can be seen on his website.